World Cryptocurrency Investment provide no information on their website about who owns or runs the business. The World Cryptocurrency Investment website domain (“my-wci.com”) was privately registered on January 31st, 2017. Further research reveals Edward Hartley crediting himself as co-founder of the company, in a World Cryptocurrency Investment video dated June 21st. Hartley does not disclose who the other co-founder(s) of World Cryptocurrency Investment are. Before co-founding World Cryptocurrency Investment, Hartley was promoting the OneCoin Ponzi scheme. Prior to OneCoin Hartley was an affiliate with Organo Gold. In early 2016 Hartley had a brief stint as Vice President of Global Sales at Visi. At the time of publication World Cryptocurrency Investment is primarily marketed in Vietnam. Alexa estimate that pretty much all traffic to the Wold Cryptocurrency Investment originates out of the country. Read on for a full review of the World Cryptocurrency Investment MLM opportunity. World Cryptocurrency Investment has no retailable products or services, with affiliates only able to market World Cryptocurrency Investment affiliate membership itself. World Cryptocurrency Investment affiliates invest on the promise of daily ROI payouts. Every 75 days World Cryptocurrency Investment charges affiliates a 35% fee (35% of ROI payments over the past 35 days). World Cryptocurrency Investment affiliates receive a 10% to 25% referral commission on funds invested by personally recruited affiliates. World Cryptocurrency Investment pay residual referral commissions via a binary compensation structure. World Cryptocurrency Investment affiliates are paid recruitment commissions via a 3×18 matrix. 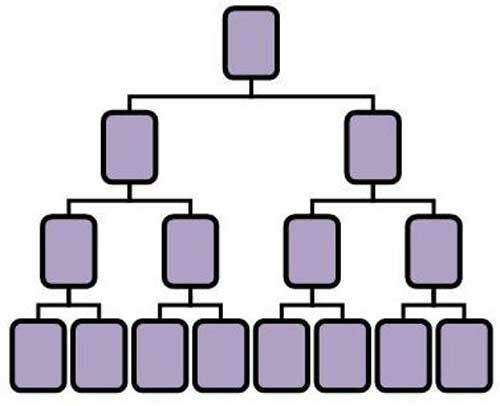 Levels two to eighteen of the matrix are generated in the same manner, with each new level housing three times as many positions as the previous level. Positions in the matrix are filled via direct and indirect recruitment of invested World Cryptocurrency Investment affiliates. World Cryptocurrency Investment affiliates are paid $10 per affiliate recruited into their matrix. World Cryptocurrency Investment offer a Rank Achievement Bonus, which is either a pool based bonus or additional percentage of invested funds. The primary difference between the above affiliate memberships is income potential via the World Cryptocurrency Investment compensation plan. Note that all payments into and out of World Cryptocurrency Investment are made in bitcoin. As far as I can tell, Edward Hartley’s stint at OneCoin was brief. He was signed up by Igor Alberts in mid to late 2016 and by the end of the year had left. Considering the marketing hype pushed out when Hartley announced he’d joined OneCoin, his quiet departure was pretty conspicuous. What’s peculiar about Worldwide Cryptocurrency Investment is that it isn’t so much “worldwide” as it is entirely being pitched to the Vietnamese. As evidenced by translators present at Edward Hartley’s promotional events in Vietnam, Hartley himself doesn’t speak Vietnamese. If I had to guess, Hartley’s partners in Worldwide Cryptocurrency Invest were responsible for OneCoin growth in Vietnam. Hartley would have been given a plumb OneCoin position under Igor Alberts when he signed up. With OneCoin starting to collapse and a bunch of leaders leaving in late 2016, Worldwide Cryptocurrency Investment is an attempt to remilk Vietnamese investors who lost money in OneCoin. The ruse behind Worldwide Cryptocurrency Investment is cryptocurrency trading. While the company does provide fixed daily ROI payments in dollars, no evidence or proof of cryptocurrency trading exists. The only identifiable source of revenue entering Worldwide Cryptocurrency Investment is affiliate investment, the use of which to pay a daily ROI makes it a Ponzi scheme. Evidently the Worldwide Cryptocurrency Investment apple hasn’t fallen far from the OneCoin tree. This will see Worldwide Cryptocurrency Investment unable to meet its ROI obligations, prompting a collapse. As with OneCoin, once that happens the majority of Worldwide Cryptocurrency Investment affiliates will lose money. Given that all investments into Worldwide Cryptocurrency Investment are made in bitcoin, good luck recovering your funds once Hartley does a runner. Update 21st July 2017 – According to a report from VN Express International, Edward Hartley passed away on Wednesday, 17th July. An initial investigation found the man, identified as Edward Hartley, 53, was at the clinic on Su Van Hanh Street in District 10 to have some loose skin removed from around his hip. During the procedure he went into a fit and died shortly after. As noted in the review, Hartley had been heavily promoting Worldwide Cryptocurrency Invest in Vietnam prior to his death. What this will mean for Worldwide Cryptocurrency Invest going forward is unclear. Update 19th November 2017 – Worldwide Cryptocurrency Investment has been renamed “Worldwide Cryptocurrency International, and is continuing on without Hartley. 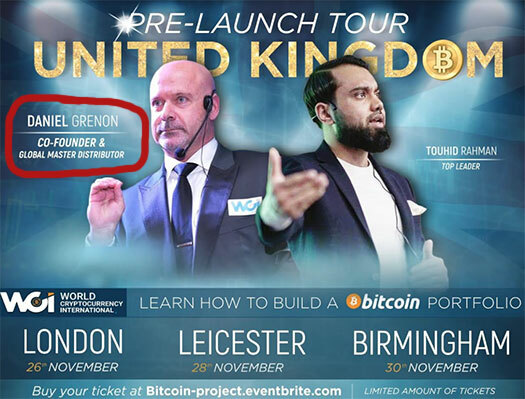 Both Grenon and Rahman are former OneCoin scammers. During his departure from Onecoin, in a live podcast (which I don’t believe was distributed), he was saying, “I’ve learned a lot about cryptocurrency and cryptocurrency is real” while simultaneously announcing his departure from the fake cryptocurrency Onecoin. OneCoin is not a scam. @Christian – uhhh, you’re a little late to the party bro. Most of the band has already left and its last call for alcohol. The only ones left to scam are the proverbial drunk girls in the corner. Better hurry and ask one to a final waltz before the lights turn off and the janitors start sweeping the puke and debris from the dance floor. You sign up, you invest and you get given points. OneCoin increase the value of those points every time they need a PR distraction. You put in a withdrawal request and they pay you with subsequently invested funds. That’s a Ponzi scam. You’re also paid to recruit new investors both directly and residually, which is a pyramid scam. OneCoin is a scam any way you cut the business model. Onecoin does not pay you unless you bringing businsss. It can’t collapse. As for WCI, that one is clearly a ponzi as it guarantees a return. Onecoin does not/ never did. Onecoin does not pay you unless you bringing businsss. Recruiting Ponzi investors isn’t “business”, it’s financial fraud. that one is clearly a ponzi as it guarantees a return. Whether a ROI is guaranteed or not is irrelevant. Using newly invested funds to pay off existing investors defines a Ponzi scheme. Both Worldwide Cryptocurrency Investment and OneCoin use newly invested funds to pay off existing investors. I sure WCI a ponzi because I invest 100$ for WCI and then they ROi me Ron BTC. After that one person call me talk with me he introduce he is “admin in Vietnam” request me give he BTC. I never give him BTC. The end my email block in WCI..
Review updated with news of Edward Hartley’s passing in Vietnam. Mr. Edward Hartley doesn’t need to disclose the traders information to the general public. If you wanted to know, you should have asked. Network marketing is based on contacts you already know NOT traffic off the internet, therefore a website does not require ANY information as this comes from the CEO and affiliates themselves. Affiliates that have SEEN evidence of traders and platforms and revenue being generated from other sources OTHER than investors. Bitcoin is used as it is an ASSET. more valuable then fiat currency. A currency that can be withdrawn instantly without middlemen and banks. This is actually in the BEST interests of the affiliates as it gives a daily cashflow that can be liquidated immediately. In future, think before you post such trash. Mr. Edward Hartley doesn’t need to disclose the traders information to the general public. Any MLM company making claims about the source of their revenue needs to fully disclose evidence of their claims to the general public. Even more so if they’re operating in a niche riddled with Ponzi fraud. In a Ponzi scheme and other closed-loop business models sure, but they’re all fraudulent anyway. In a legitimate business model you make sales to the general public (retail). As such any claims have to be provided on the MLM company website with accompanying evidence where applicable. Not good enough and likely BS. Any MLM company soliciting investment from the general public needs to be transparent if they’re claiming to have an external revenue source. Agreed. Perhaps the sentiment would work better if you reminded yourself at the start of your comment though? Review updated with news of Daniel Grenon taking over Worldwide Cryptrocurrency Investment after Hartley’s passing. Grenon has renamed the company “Worldwide Cryptocurrency International” and is gearing up for a “prelaunch” in the UK. Very informative and well explained .I would like to update that WCI has made some changes in few months since the departure of Edward Hartley. People have been reportedly joining the company and then earning through networking, but the point still lies whether its a ponzi scheme or not because they are not showing any business done to it’s investors as a proof of earning. They’re not showing anything because there’s nothing to show. Edward Hartley didn’t make Worldwide Cryptocurrency a Ponzi scheme, using newly invested funds to pay existing investors does. grenon is not anymore in WCI!! John Rock is the CEO of wci and granon was sacked. What can you say about this? A company that is going no where will not be putting all this measures in place i think. How much money did Granon squirrel away before he was “sacked”. When your business model is Ponzi investment it doesn’t really matter who’s in charge. NO PERSON GETTING ROI!! SCAMMERS! Is this real real in Uganda (Africa) we have Fintegri run by a one Ssemirembe Ronnie. Sounds like a local ringleader, I doubt any of Fintegri’s western owners/management speak African.